Poor old No Man’s Sky. It isn’t a bad game, really, but nor is it the fun-loving, free-wheeling space-exploration game that many had hoped for. We can sit here and debate the relative merits of ‘artistic ownership’ versus ‘consumer expectation’ all day, but the fact remains that a lot of people aren’t happy with NMS. I’m certainly one of them. However, having bought and loved PlayStation VR it occurs to me that No Man’s Sky has the potential to be a truly magnificent game if it can somehow make the leap to virtual reality. Is this technically possible? I suspect only the guys at Hello Games know the answer, as they’re the magicians who enabled billions of planet variants to magically emerge from the game’s code. Would it make the game more commercially successful? Absolutely - early PSVR adopters are hungry for games, new or old. Would it fundamentally change the way No Man’s Sky is played and perceived? Yes. Yes it would. One thing I’ve learned from playing VR in my own, sweet time is that successful games aren’t the ones that focus on pushing you from A to B in the way ‘normal’ video games do. The true beauty of VR is in the exploration and being inside a new world. To take a well-used analogy and extend it: it’s not about the destination, nor the journey, but the car you’re sat in. The things I recall most fondly about my time with VR to date are the small details like blowing smoke in London Heist, staring at myself in the mirror as Batman, or gasping as my stack of blocks wobbled in Tumble. Blocks, people. Blocks. This celebration of the small things, combined with VR’s most obvious advantage (the fact it puts you actually inside the game world), would work wonders for No Man’s Sky. Let’s face it, the slow-paced exploration of each planet gets dull very quickly when you’re on a flat screen - it’s like playing Destiny and spending your whole time just collecting Relic Iron. Even when randomly-generated planets look radically different, you’re still doing the same thing over and over. VR deprioritises the ‘doing’ and places the emphasis on the ‘being there’. All of a sudden No Man’s Sky’s biggest asset - its weird and wonderful worlds - marry perfectly with VR’s most interesting facet. Imagine actually being on one of NMS’s planets, exploring caves, climbing the mountains and hunting the critters that scurry around you. Not just joylessly collecting minerals with the tap of a trigger, but harvesting them by touching or blasting them with a Move controller. Then imagine taking off in your ship and surveying the world below you before blasting into space and feeling that powerful lurch in the pit of your stomach. After that? A 360 degree view of space around you, where you can turn your head to look at your place in the massive galaxy. It sounds a bit trivial, but anyone who has played VR knows that these small things become absolute game-changers when you’ve strapped on the headset. And after that? EVE Valykrie-style dog-fights, or getting up-close and personal with the strange alien merchants in the game. What about actually walking around a ship, checking out all its curves, before you commit to buying it? There would be little need to actually add fresh features to No Man’s Sky for a VR version (perhaps a tweak to on-foot controls to avoid player motion-sickness), but the shift from flat-TV to being inside the world would make a huge difference. 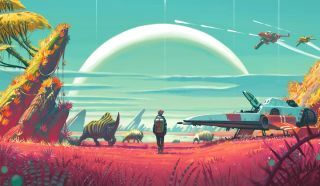 It would take the cold, rather detached feel of NMS and place the player in the middle of a true sensory experience, ironically replacing the game’s main selling point of ‘vast scale’ with that of ‘infinite wonderful details’. It’d give the whole idea of a player’s journey being ‘unique’ new meaning, because you’re actually there experiencing worlds and not just giving them silly names like ‘Bumzor’ or ‘Willytopia’. I strongly suspect that Sony and Hello looked at the possibility of making No Man’s Sky a VR game. The proximity of its release to PlayStation VR, and the fact that it seems to suit the medium perfectly are coincidences that are tough to ignore. My own personal speculation is that both parties probably tried to make it work (perhaps at the expense of other features players requested, like multiplayer), but decided it simply wasn’t going to happen on time and on budget. Perhaps that explains some of the delays and drop in visual fidelity, perhaps not. However, I like to think that - if it is possible - neither Sony or Hello would dismiss the dream of bringing No Man’s Sky to VR. It’d certainly realise the potential of a very ambitious yet deeply flawed game, and give PSVR owners a serious piece of adventure to digest.